A look at what’s new from Facebook, Sprint, Videxio, Starfish, and Unified Office. It's been another busy week in enterprise communications -- and one that's been full of surprises. Genesys CX18 and Facebook F8 events, both taking place this week, brought contact center, customer experience, and team collaboration into sharper focus; a newly penned merger deal for Sprint and T-Mobile drove 5G and cellular back into the spotlight; and acquisitions and executive leadership changes at Cisco and Five9 had a lot of people talking about artificial intelligence and the cloud. But wait, there's more! In this week's No Jitter Roll, we take a look at news around integrations, secure Wi-Fi, video, contact center solution provisioning, and Internet of Things (IoT) routing. Out of Facebook's F8 Developer Conference this week, more than a few vendors announced integrations with Workplace by Facebook. Among the enterprise communications-related integrations are Vonage's Vee chatbot, as covered in an early No Jitter post by contributor Zeus Kerravala, and work management and video integrations from Smartsheet and BlueJeans Network, respectively. Smartsheet, a cloud-based platform for work execution, announced a mobile-enabled integration with Workplace. Via Smartsheet for Workplace, customers can get Smartsheet notifications, reminders and approval requests delivered to them within Workplace Chat, and can take action without needing to toggle back to the Smartsheet interface. This integration is a first of its kind for Smartsheet, as it leverages Converse.AI Chatflow technology to automate workflows and data exchanges through the application of natural language technology. The company also integrates with enterprise applications from Microsoft, Google, Salesforce, Atlassian, Box, and others. Cloud meetings provider BlueJeans Network, already a partner of Facebook for multiparty video meeting streaming in Workplace, announced its latest integration with Workplace. This new integration lets Workplace users launch BlueJeans meetings by adding @BlueJeans to their Workplace Chat. "Because employees have questions that often require complex explanations, or coworkers need to see each other face-to-face to make key decisions, there should be a mechanism to instantly connect from Chat without killing the conversation to go find a room or toggle between technologies," said John Knightly, SVP of product and solution marketing at BlueJeans, in a prepared statement. In addition to announcing the merger deal with T-Mobile, Sprint this week launched Sprint Secure Wi-Fi, an application for Sprint-subscribed smartphones and tablets that aims to protect users connected to unsecured public Wi-Fi by way of data encryption. "Every day, millions of mobile device users connect to unsecure public Wi-Fi -- hotels, coffee shops, restaurants, etc. -- making them vulnerable to malicious users and content," Sprint said in its press release. "Something as simple as checking the weather or skimming through social media can potentially put sensitive data and credentials at risk. Traffic on public Wi-Fi connections is often unencrypted, leaving the user's phone susceptible to attack." Sprint Secure Wi-Fi works by encrypting all data that passes through the Wi-Fi network to the Internet, functioning as a "smart VPN" that lives within a Sprint-subscribed Android or iOS device. It automatically turns on and off when the device is connected to and later disconnected from an unsecure Wi-Fi network, which the device identifies as unsecure by a lack of password protection or encryption. Secure Wi-Fi is meant as a compliment to Sprint Secure, a suite of security solutions for businesses. Secure Wi-Fi will be available to Mobility-as-a-Service unlimited plan customers for no additional cost, and to Sprint-subscribed iOS and Android users for $1.99 per month. Cloud video and collaboration provider Videxio made a series of announcements this past week with a common theme: Down with plugins! 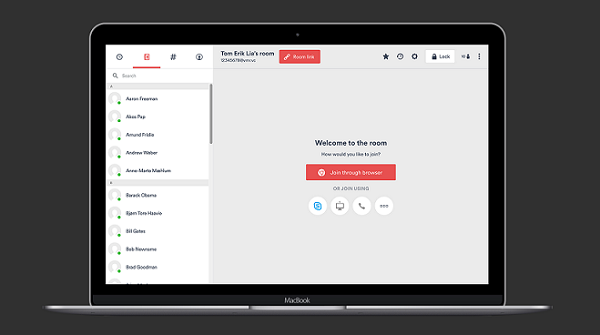 Videxio users now have all the features of the My Meeting Video desktop client -- including point-to-point calling -- available to them in their Web browser. Videxio meeting invites now feature a "Join from Browser" button -- no plugin required. With support for WebRTC, required for the plugin-free capability, by all major browsers, the Videxio plugin-free capability is available for Chrome, Firefox, Opera, Edge, and Safari users (with IE still requiring a one-time download plugin). With video collaboration, "the ideal world is, I just click on the button and I'm in the meeting," said Videxio Americas president Karl Hantho, in a No Jitter briefing. These capabilities that Videxio is now offering represent getting a little bit closer to this ideal, he added. "This is us trying to simplify the world and how you can join meetings. ... It's about improving the user experience." Out of Genesys CX18 this week (see related coverage here), multivendor software communication management solutions provider Starfish unveiled a release of its Provisioning Solution that adds support for Genesys CX platform. Starfish now offers solutions focused on making the process of migrating contact center agents and configuration data from legacy platforms to Genesys PureEngage, specifically for organizations that are migrating to Genesys for contact center. It's available in two different migration packages, both of which include a provisioning portal and migration wizard for facilitating the move between contact center platforms. Additionally, users get bulk provisioning and deprovisioning tools, as well as a workflow engine for automating and streamlining on-boarding and off-boarding of agents. In addition, the release adds integrations with ServiceNow, for IT service management, and Workday, for HR applications. In a little bit different news, managed services provider Unified Office announced that it has been awarded a patent for its Highest Quality Routing Protocol (HQRP), protecting the method and apparatus used for routing voice calls over VoIP networks. HQRP is meant to eliminate the need for businesses to use expensive dedicated T1 access lines, MPLS tunnels, and other legacy techniques, Unified Office said. Additionally, HQRP is the network on which the company's UC and VoIP solution for businesses Total Connect Now is based. The HQRP transmission network works by "continuously finding the best end-to-end bi-directional paths, creating the highest quality and most reliable communications sessions be the[y] voice, video, IoT or other real-time information," said Unified Office CEO and founder Ray Pasquale. This is the company's second patent. The first was for its Visual Performance Suite and its ability to provide a real-time view of operational performance level changes and actionable intelligence to businesses.